Welcome our alumni and friends for a special Reunion Weekend and Concert in June, 2019. Record our fourth CD, this time focusing on Americana music. Expand our board and advisory group membership. Expand our partnerships with area nonprofits, such as our work with the editor of the anthology Bullets into Bells in our spring 2019 “Season of Giving Back”program where we will focus on the issue of eliminating gun violence. On Saturday, October 13, Back Bay Ringers teamed up with Brian Clements, editor of the anti-gun violence anthology Bullets Into Bells, for a presentation at the Boston Book Festival in Copley Place. The anthology was inspired by the shootings at Sandy Hook. Mr. Clements and four contributing authors read their poetry, and BBR provided musical interludes of contemplation and reflection. The event was a preview of this spring’s “Season of Giving Back” concert series, where Mr. Clements and his fellow writers will join with BBR for continued reflection and action on the issue. All proceeds from our spring concerts will be donated to Stop Handgun Violence, a local charity dedicated to work on this critical social issue. Stay tuned for more information after the holidays. Holiday Concert Tickets on Sale! 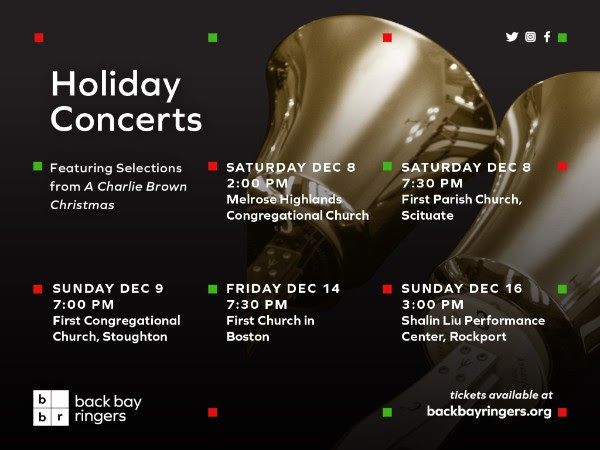 Tickets are already on sale for this winter’s concert series featuring songs from “A Charlie Brown Christmas,” as well as original transcriptions of Barbara Streisand’s ‘Jingle Bells’and Mariah Carey’s ‘All I Want for Christmas is You!’ Definitely a concert you do not want to miss. Our performance on December 16 at the Shalin Liu Performance Center in Rockport, MA is nearly sold out, so don’t miss your chance! Tickets for all of our performances can be purchased here. I had a lovely red leaf fall across my path, and it reminded me that, indeed, autumn is here, and BBR’s winter concert season is not far behind! We are busy already with new ringers and an early appearance at the Boston Book Festival, Saturday, October 13 on Copley Plaza, Boston. For the Festival, we are partnering with Brian Clements, Editor of an anthology on anti-gun violence entitled Bullets Into Bells. The anthology was inspired by the shootings at Sandy Hook. For more information about the Boston Book Festival, and to see the full Festival schedule visit the Festival website. Our connection to Bullets into Bells will continue this spring with our “Season of Giving Back.” Mr. Clements and authors from the book will also appear at our spring concerts and BBR will donate all ticket proceeds and donations to the local anti-gun violence charity, Stop Handgun Violence headquartered in Beverly, MA. More info will be released closer to the date. We are delighted to release our latest video recording, this one of the piece Jovano Jovanke arranged by Michael Joy. Scroll down to see the video! We look forward to seeing you at our concerts in December. Tickets are on sale for all of our events at this link. It’s never to early to purchase! Are you interested in performing with BBR this year? All returning and aspiring musicians will audition for the group on Monday, August 20th, at 6:30 pm at First Church Boston Please take a look at the audition page on our website and fill out the interest form there if you are considering auditioning. It might be hot and humid now, but BBR is looking ahead to Christmas! Our concerts for our winter season are set (see below for details) and we are ready to get going this fall. Thank you to everyone who supported the Boston Living Center this spring season. We are so proud to be presenting a check for $2,200 to the organization later this week! We could not have had such a successful donation without the support of our amazing audiences. Did you know that BBR accepts new ringers every fall? We will be launching our winter season with auditions on Monday, August 20th, at 6:30 pm at First Church Boston Please take a look at the audition page on our website and fill out the interest form there if you are considering auditioning. Our winter dates are already set! Please check below and save the date for our winter season. We will be officially announcing our winter theme later this summer and it is one we are sure you will love! Spring has arrived and the Boston Handbell Festival is fast approaching! 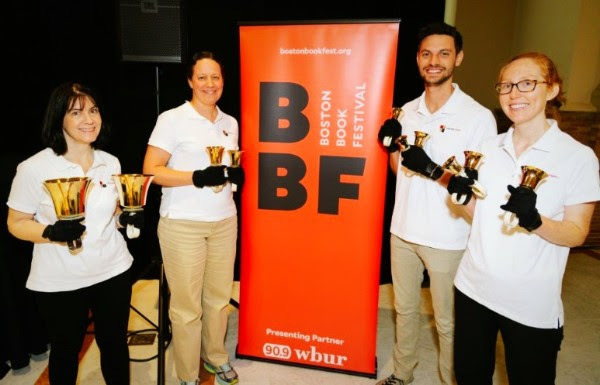 The history of BHF goes back to the handbell ensemble of Perkins School for the Blind, which had long held a handbell concert at Old South Church on the third Tuesday of May. When the handbell director, Adele Trytko, retired from the school in 2006, there was no festival. However, attendees returned to Old South Church expecting a handbell concert! 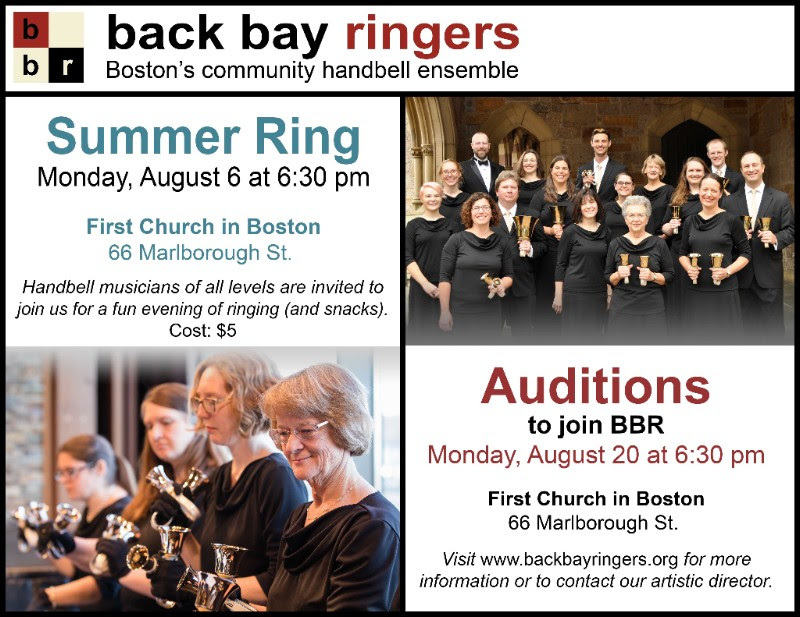 Griff Gall, Artistic Director of the Back Bay Ringers, approached the Old South Ringers about continuing the tradition with a new Handbell Festival, which has been held annually ever since. To celebrate the connection with the Perkins School for the Blind, we are very happy to welcome their current handbell ensemble as a very special guest choir at this year’s Festival. We can’t wait to hear them perform! Spring is a time of change. The snow melts and leaves come out on the trees. For Back Bay Ringers, spring is a time of giving, in which we give back to organizations in the Boston area that are change makers in our community. To celebrate all the change of the spring season, we are releasing a new video of Metamorphosis by Michael Helman (see below). BBR believes in the power of music education to make change for our children. Each year, Back Bay Ringers donates a two-octave set of Malmark Choirchimes to a Boston-area school at the Boston Handbell Festival. We hope a donation of a set of choirchimes will provide a valuable resource for one of our local schools. The next donation will occur at the 12th annual Boston Handbell Festival, May 15, 2018. If you know a music teacher who would benefit from a new set of handchimes, please forward this information and direct them to our chime donation websitefor more information and to submit an application. This year’s deadline is Sunday, April 1, 2018. We may be bouncing between winter and spring weather here in Boston, but at BBR we are busy looking all the way toward June. For the second year in a row, the Back Bay Ringers will be supporting a Boston area non-profit that supports the LGBTQ+ community. This year our concert proceeds will support the Boston Living Center, a division of Victory Programs, which supports the wellness of all HIV positive people through education and support programs. We are so happy to be partnering with such a dedicated organization. To learn more about the Boston Living Center, visit their website at https://www.vpi.org/boston/. The Back Bay Ringers want to thank all of our audience members for our wonderful Christmas season. We couldn’t do what we do without the loyal support of our audiences. To make a gift toward BBR’s mission of “promoting excellence in handbell artistry through performance, education, and community,” visit our donation page. Welcome to September, and all the busy-ness that comes after Labor Day. The slower pace of summer was lovely, but the Back Bay Ringers had no rest from preparations for a great winter season! The Ensemble will be bringing back Our Favorite Things for our Christmas 2017 theme, and will be returning to old familiar venues as well as venturing to new places. Be sure to check out our full concert listings on our website and save the dates! Tickets will be available soon. September also brings the beginning of holiday preparations. Are you in need of an innovative addition to your holiday gathering? 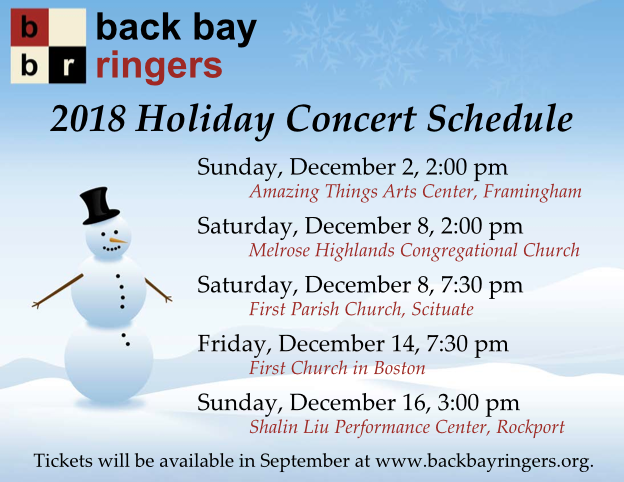 Back Bay Ringers Christmas Quartets are just thing! We have played anywhere from private parties to holiday strolls. We’d love to enhance your event! Find more information and our contact form here. We can’t wait to see you for the Most Wonderful Time of the Year!